So the installation is finally done! It was a huge amount of work, but I’m happy with the way it turned out. 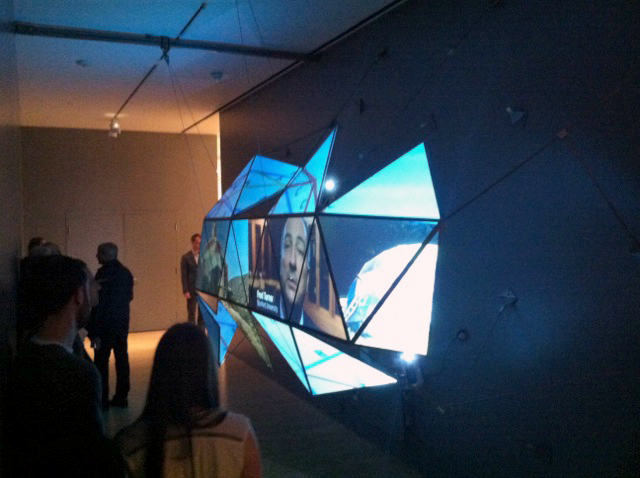 The whole SFMOMA exhibition is up too, so if you’re in San Francisco, stop by the museum and take a look. 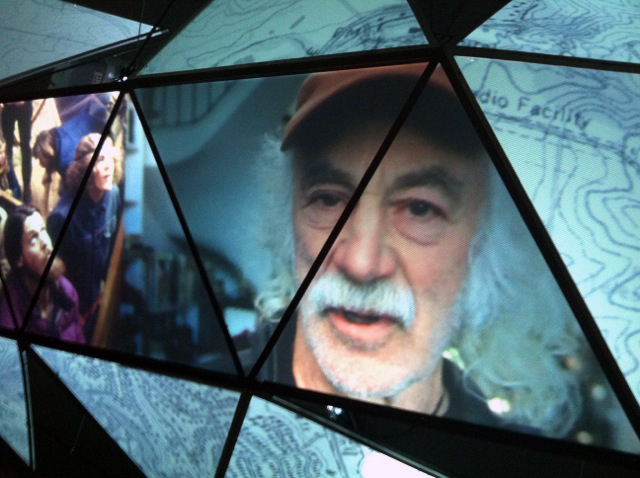 My video is called “Buckminster Fuller and the Bay Area: A Relationship in 11 Fragments (inspired by the Dymaxion Chronofile).” The piece is a series of vignettes about different connections Fuller had to San Francisco. It’s on a loop, so it’s always playing. The sculpture part of the installation is inspired by Fuller’s Dymaxion Map of the World and was designed by SF projection company Obscura Digital. One of the huge challenges for me was to create a piece that would take advantage of the sculpture and feel almost collage-like but at the same time work as a coherent narrative. There were definite stories that I wanted to tell here, so that clarity was necessary. We found, through trial and error, that too much “collage” made it impossible for the viewer to follow things––the piece became overwhelming––but not enough “collage” and it felt like we were squandering the potential of this cool sculpture. Finding that balance was the real work, and I hope that we’ve done it. I’m back in NYC now, working on the second part of my commission for the museum: a “live documentary” about Fuller that I’m going to premier on May 1st. The band Yo La Tengo will be performing a live soundtrack, so I’ve been going out to Hoboken all week to work with them. It’s been a super interesting collaborative experience. Making music for movies is always a complex and challenging process; there’s no right or wrong way to go about doing it. And even the language is tough––as a director, you find yourself saying weird things like, “Could you add a little more heartbreak to that song?” Anyway, we seem to have found a pretty organic way of developing the soundtrack, and I’m very excited about the songs that are taking shape. More details in the next post. 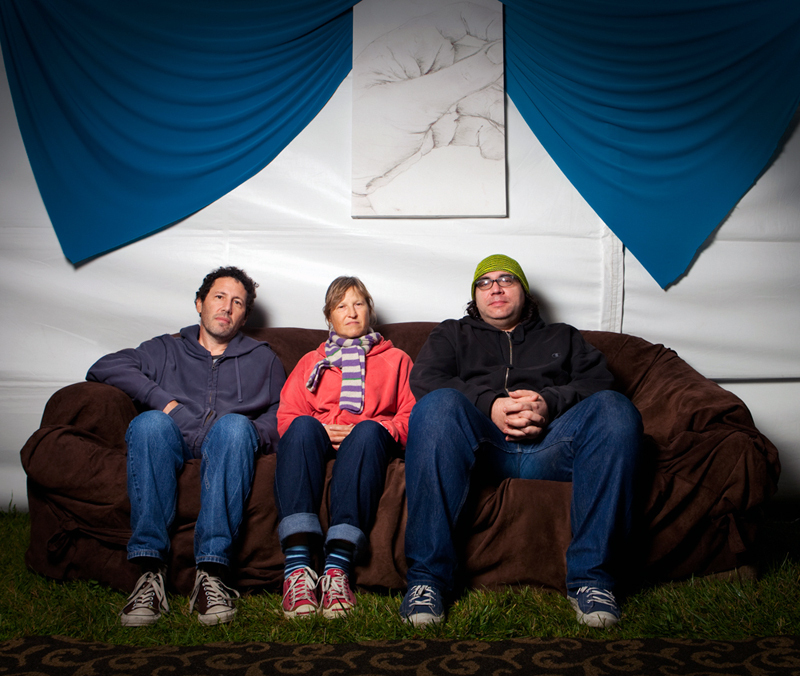 Yo La Tengo image courtesy of Josh Sanseri Photography.